Carl Nielsen took Danish music into the 20th century, and his chamber music has a prominent position in the international repertoire. In spite of this Carl Nielsen only composed a limited number of chamber works for strings. This CD features two of his string quartets (in G minor and G major) and the only string quintet (in G major) he ever composed. All three works played a central role in Carl Nielsen's musical career, since they were major successes for the debuting composer and contributed to his initial breakthrough. The members of the Young Danish String Quartet met at a music camp in rural Denmark. In 2001, with a push from Tim Frederiksen, a professor at the conservatory in Copenhagen, they officially formed the quartet while still in their teens. Since then competition victories and successful tours have brought the quartet deserved attention. And no member is yet over 25, so the statute of limitations on the qualifier ''young'' in its name has a ways to run. 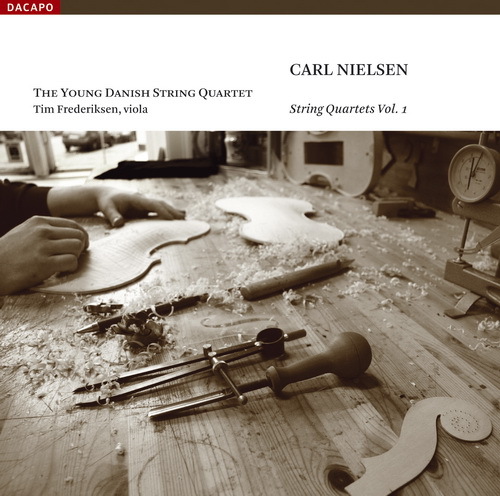 A new recording of two string quartets and the String Quintet by Carl Nielsen confirms the strong impression the group made in two New York concerts over the last few years. These are youthful and energetic performances. And the maturity and authority of the playing suggest that national identity matters. These young Danes seem to have genuine insight into the music of their country's best-known composer. Nielsen, who died in 1931 at 66, is generally consigned to those turn-of-the-century composers who resisted the radical upheavals epitomized by Schoenberg and Stravinsky. Actually, in his way Nielsen was a free spirit who protested against what he called the ''Danish smoothing over'' in style. He introduced spiky harmony, roaming tonality and unhinged rhythms into his strongly personal and often searching works. Even in the early Neo-Classical Quartet in G minor the music has an obsessive streak, especially in the restless scherzo. The Quartet in F, composed in 1906 and revised in 1919, while also essentially Neo-Classical, abounds with intriguing oddities: passages of aimless yet haunting harmony and outbursts of splattering counterpoint. For the early String Quintet in G minor, an elegant work with a bittersweet Adagio, the young players are joined by their mentor, Mr. Frederiksen. Clearly they were not too intimidated by his presence: Mr. Frederiksen plays the second viola part. Recorded at Danish Radio Concert Hall on 27-31 July, 11-13 and 19-20 August 2006.